Print Newsletters: Layout & custom high-res print Masters for as little as $150. An obvious advantage of printed newsletters is that they have a physical presence and can be saved by the recipient for the information they contain. They can also be passed around, which increases the readership at no cost to you! Printed newsletters can be taken on the road by your sales representatives to be left with clients and prospects and placed in your lobby for the attention of your visitors. For as little as $200 per issue we will create your own custom company, club or employee newsletter using your own material. At no extra charge we will review your material for spelling and syntax errors to ensure that it is the very best that it can be. If you wish we'll also provide interesting and relevant material to complete your publication at no extra charge! Use one of our FREE Standard Designs and at no extra charge we will customize the colors to match your branding. Alternatively, for a mere $100 Design Fee we will create a design that fits your vision, or recreate one that you submit. Printing on your choice of stock in single or full color. 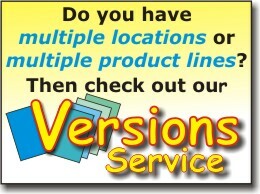 Distribution to your mailing list at the lowest available USPS Bulk Mail rate. Turnkey Content Service where you leave it all to us, although you still have Final Approval of all content. 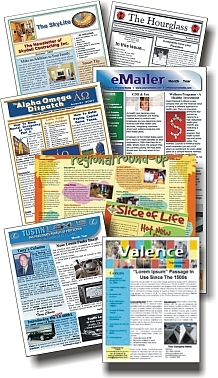 Click HERE if you would like more information on our Print Newsletter services.